Sosbee to Gainer- "stop your silly little visits to my site; you have nothing to say, except in a cryptic and childish fashion and I perceive your character as contemptibly pathetic." Note that none of the Senators actually responded to my legitimate queries, except for the auto response messages referenced above; instead, the quasi-criminal mind of self-consumed Gainer is used by the Senate to deliver a kind of psychological assault on this fbi/cia Target of ten years. Finally, the disgraceful Senator Cornyn is deserving of at least a public reprimand for dereliction of duty because he is on the Committee On Armed Services of the U.S. Senate, and he has a duty to respond to a veteran who is being tortured by the fbi/cia globally. Government of The United States of America "
As of 3-13-10, Sosbee notices that some of the doctors (et al) who assist the fbi/cia in the torture and attempted murder campaign against him are direct contributors to Senator John Cornyn and his political machine. This observation is most revealing with regards to Cornyn's own dirty corruption and his murderous affiliation with citizen stalking groups and fbi/cia assassins across the country. Other members of congress no doubt also receive money from the most despicable members of the ruling class of our society. 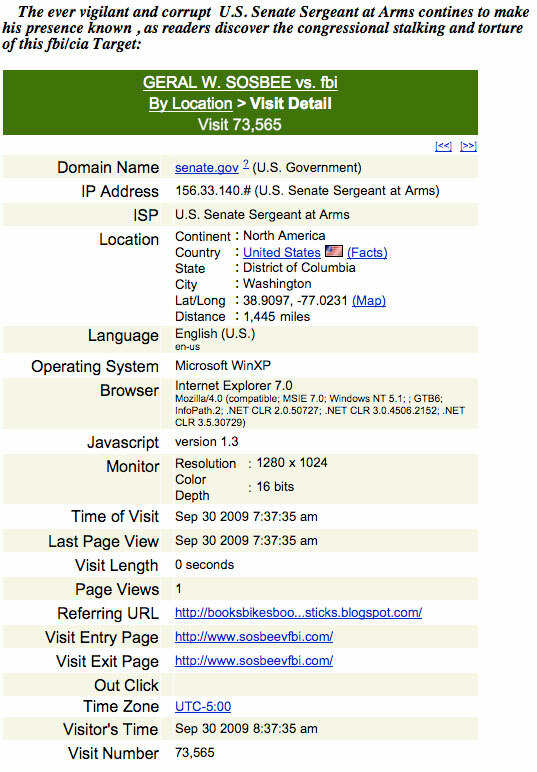 Click Here For More fbi terrorist threats to Sosbee regarding "Increased Sleep Deprivation". 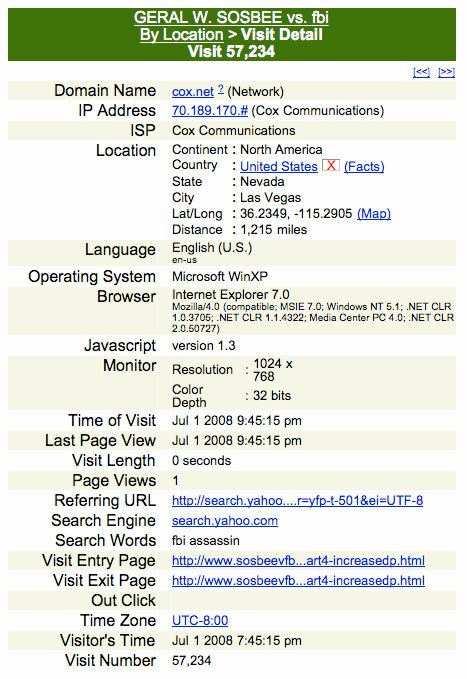 On or about May 24, 2009, the search engines (Google & Yahoo) notified users that http://www.sosbeevfbi.com cannot receive a security clearance; the same day the home page at the Sosbee site began to load and re-load repeatedly, or to use other words, the page engaged in a perpetual, or 'unlimited refresh' which effectively prevents use of the page as a home page. 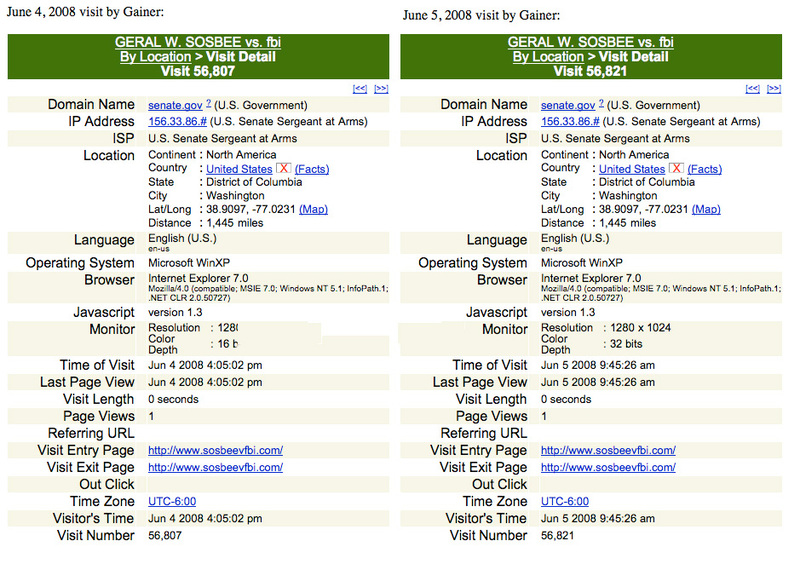 When I reported the problem, both the webmaster and the service provider initially stated that they see no problem with the site; but then on second look (on May 26, 2009), the service provider noticed that the glitch occurred only when the viewer used the Explorer browser. I realized then that, as I use the Explorer browser, the bug was possibly planted to frustrate me (and others) during the Holidays. On the same day, the service provider located the exact location of the problem as follows: an infected code had been entered by the fbi in the site's "TOP" link originally entitled as "jumptop.js" by the webmaster. Then, the webmaster fixed the problem by deleting the suspect link which had heretofore never been a problem. Without the expertise of the service provider, the bug or virus would have been difficult to find and to fix. I hope that this incident may assist other site owners whom the fbi/cia may target for similar assaults.